Recently I had a chat with Saradhi Sreegiriraju and Ed Lee from Tintri about their new version of their Tintri Storage appliance, Tintri VMstore. This new version is an update of their first model with some really nice new features. New features that (I think) make the Tintri VMstore a real Enterprise solution. Let me first explain what the Tintri appliance is. It is a box with a fixed set of SSDs for performance combined with a set of SATA disks for capacity. 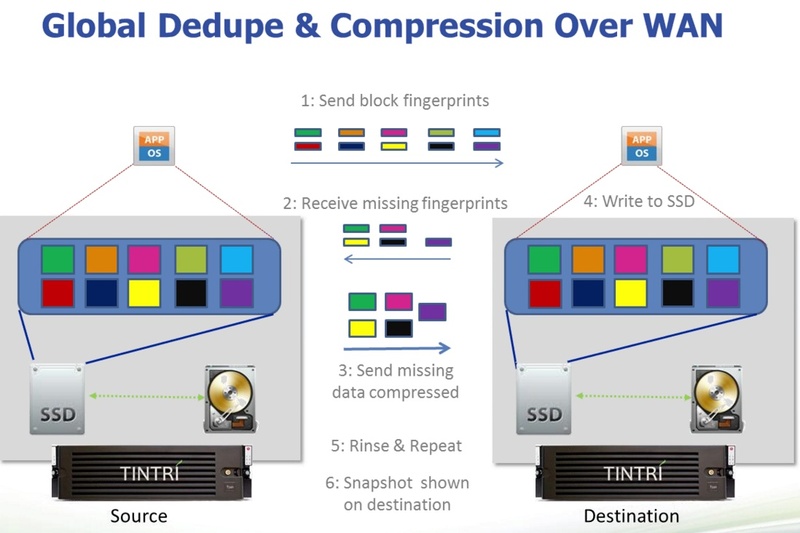 The utilization of the SSDs has been designed in such a way that by using compression and dedupe, between 98% and 100% of all read and write actions can be handled from the SSDs directly. Customer experience (Tintri currently has over 180 customers) has shown that only during backups a request is sometimes NOT serviced from flash. The Tintri T540 model offers 13.5TB of usable data storage of which 2.4TB is SSD storage (before dedupe and compression). The Tintri appliance is able to keep “hot” blocks in flash if needed and if needed, the admin can move a whole VMDK into the SSD cache. “Cold” blocks of data are periodically moved to the SATA disks, continually freeing up space in flash for active workloads. The beauty in management of the storage is that you no longer need to worry about LUNs and RAID configurations, since there is only one big datastore managed by Tintri. Where other storage mostly reports IOPS and latency based on LUNs or RAID groups, Tintri is very VM oriented and will work with you on a VM level. You can see per VM and VMDK latency and how many IOPS each VM is generating. The Tintri appliance is placed in your data center as one shelf and cannot be extended. If you need more storage you buy an additional appliance. Each appliance will present itself as NFS storage to your ESXi hosts. Each Tintri appliance can handle up to 1,000 VMs, depending of course on type and size of each one. Unlike other storage, Tintri enables both server and desktop VMs to coexist on the same datastore, allowing for both VDI and server apps to be on the same system. On the hardware side, not much has changed. Where the very early model had just one storage adapter, this new release now has two redundant controllers and each controller has a 2x10Gbit connection. Nothing spectacular but something a true Enterprise ready storage should have. At the software level we can find the most changes. Tintri now introduces the Tintri Clone feature. As stated in the first part of this article, Tintri is VM orientated storage and this new cloning feature is also fully VM orientated, which means you clone at the VM level, not at the LUN level. This new cloning technique works mostly in the meta data and therefore has minimal performance overhead. When using the clone feature for VDI solutions, Tintri is able to deploy 1000 desktops including customization in little over an hour. Another interesting observation and improvement I noted from this software release was the similarity of the software-defined storage features that Tintri delivers today to the future functionality that vVols will deliver in a couple of years. This will make it extremely easy for Tintri to support and their customers to adopt vVols when it does arrive on the market. Tintri can now attach storage attributes and policies to a VM and set a QoS on a VM. It allows for VM and VMDK pinning to flash and you can isolate VDI IOPS from Server IOPS. To be clear, this is already present without VMware vVols. The biggest changes in this new product from Tintri are the snapshot and the replication features. 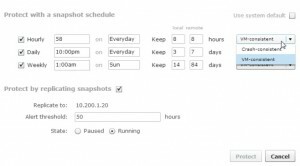 The snapshot feature allows you to create VM snapshots on a regular schedule and use them for fast recovery, shortening your RTO. A snapshot can be created hourly, daily or weekly or a combination of all. 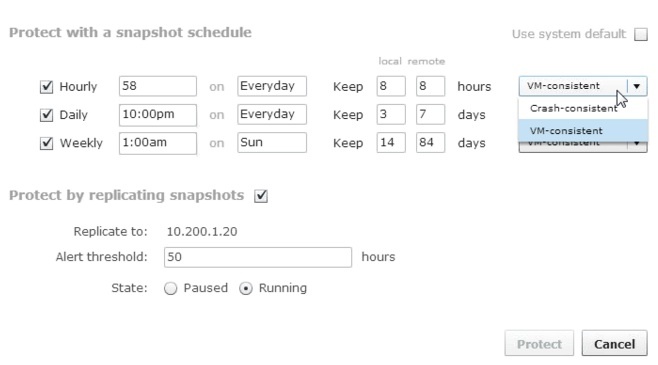 Per snapshot you can configure if it should be replicated and how long to keep the snapshot on the local storage and how long to keep it on the remote system. You can also choose for a crash-consistent or VM-consistent snapshot. The crash consistent is just a “dirty” snapshot of the VM, where the VM-consistent snapshot will quiesce the guest OS using the VMware Tools. The new replication feature, called ReplicateVM, will replicate on a per VM basis to its partner using the snapshot schedule for each VM, which can be as often as every 15 minutes. Replication can be done in a many to one relation, meaning that you can have multiple Tintri systems replicate to one destination system. To replicate as efficient as possible, Tintri has come up with this intelligent algorithm. First of all, you can pre-seed the target side with existing VMs or backups. Secondly there is a very intelligent dedupe and compression over WAN mechanism where the source will send a fingerprint of all the changed blocks. The target compares this fingerprint with data the target already has and then reports the missing parts of the fingerprint to the source. The source will now send the missing data compressed and the target will write this to SSD. After a few iterations the snapshot is available on the destination. These snapshots on the target can also be used to create clone VMs on that same target that then can be offered to the ESXi hosts on the target side. 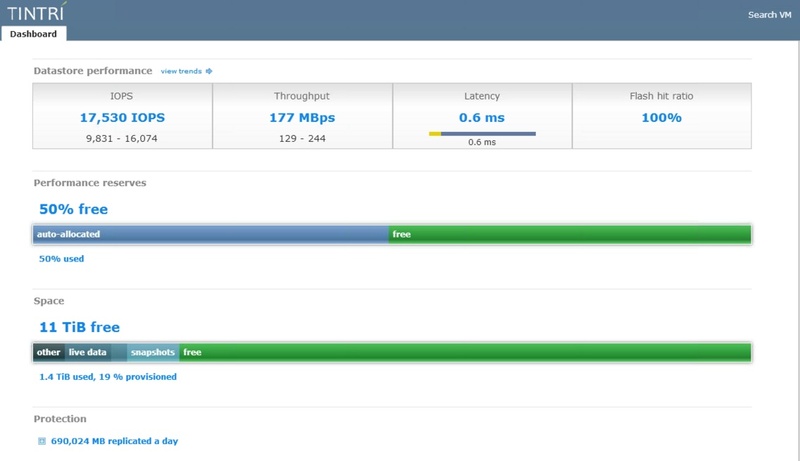 One of the big plusses of Tintri is the in-depth monitor that can tell you latency, IOPS, replication bandwith, etc. on a per VM basis. In most vSphere environments you need to combine vCenter Server performance graphs and your storage monitoring to get a clear view on how your VMs are performing storage wise. The storage will often give you a good view at what is happening at the LUN and storage level, but not at the VM level. Tintri offers a view on your VM performance that goes right from vCenter to the storage level. This is a very big plus when searching for possible performance issues. 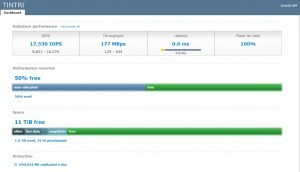 When writing this post, Tintri gave me access to their lab and I was impressed by the speed at which VMs could be deployed and how easy it is to setup snapshotting and replication. All functions available in the Tintri appliance are easily accessible and it is very simple to learn how to use them. In my opinion you will get a storage appliance that is very easy to use and maintain. No more worries on LUN sizing, pool sizing, RAID sets, etc, etc. This will save the storage admin a lot of time.